Rosewood is a Budget 3 bedroom holiday house in original condition with little upgrades over the years. Perfect if you want low cost Jindabyne Accommodation close to the shops, bars and restaurants for 8 guests. 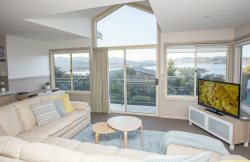 It may not be the standard of other Jindabyne holiday properties but it is warm and has most things you will need for your Jindabyne Holiday. The living area has a flat screen Digital TV, DVD plus 2 old often used, but comfortable, leather lounges. The adjacent dining area has an old world feel decor with faux wood paneling on the walls and the same vintage, dining suite. There is reverse cycle air in the lounge area. Lake Jindabyne is just across the street and Jindabyne town centre shops and the Bowling Club are just a three minute walk. The kitchen has a fridge,microwave and electric stove but no oven. There is cutlery and crockery provided and some pots & pans. Two bathrooms are reminiscent of the 1960's with the tiling and fixtures .Some of the light fittings are missing and doors are getting worn with years of use. Towels are provided. The three bedrooms are down the hallway with queen bed in the first, with a set of bunks and double. The third bedroom has two single beds. Linen is provided. There is a laundry room with a washing machine and dryer and a small room to leave your ski or summer gear. Parking is off street up the steep side driveway (2 wheel drive OK). Rosewood is one of the original homes relocated from the "Old Jindabyne" in the 1960"s and as such has the original feel (even an original Everhot wood burn stove, not working,display only). Please be aware this is a very old and well loved house and is showing its age with little or no recent renovations completed. But hey its cheap, warm and comfy! Cosy, vintage decor cabin. Extremely close to shops and restaurants! Team members were very friendly and helpful, made everything smoother without any worries. Very convenient and safe to use. Know what you are going to get. No worries of being scammed or anything. Communication was great. The stay was amazing. Everyone enjoyed it and really loved the place. Definitely recommend, and will stay there in future again. Rosewood is a great place to stay without breaking the bank! Always friendly, happy to help and very welcoming. I Have not had any issues with the teams customer service and that in itself is something you should all be proud of. I have stayed twice in the past few years with different groups of friend. All have been happy with the property. It doesn't have to be fancy or new to be a nice enjoyable place to stay. I much prefer the old style cosy feel the cottage gives off as it shows a bit of the history of Jindabyne in its earlier days. Peter is always super helpful and friendly! Had a great stay and no issues! Friendly and professional greeting and check out. Will book this property again, close to shops and the Jindy Bowling club, roomy and best value in town. We had a great stay in Jindabyne and experienced the surrounds on recommendations from our host Peter. We would definitely stay here again and recommend Ray White Real Estate and the team for their exceptional service. Our stay at the Rosewood property was really enjoyable. The house is spacious and tidy. Plenty of room for the 6 people we had staying there. It has a great location, close to the shops while still avoiding road noise. And a nice little balcony to enjoy the view of the lake from. Should you wish to mail payment or pay by EFT please contact us via email so we can supply you with the correct details for efficient transaction.